Al-anon is a group for family members of alcoholics. 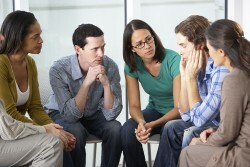 Like Alcoholics Anonymous, Al-Anon is similar to community-centered group therapy. Most people who join Al-Anon do so for this support. The only requirement of Al-Anon is that you have a friend or family member that is struggling with alcoholism. The members in the group support each other by sharing experiences, commiserating, and offering advice to each other. We can help you find addiction treatment. Call 800-895-1695 toll free anytime to find the help you need. Admit that Alcohol is the problem and that you cannot do anything about it. Believe in a higher power that can help you with the issues associated with Alcoholism. Decide to turn your life and will over to the higher power so that it can be corrected. Look at yourself in an unbiased way; inventory all of the good and bad things. Admit to the higher power, yourself, and one other what you have done wrong in the past. Ready yourself to have the higher power remove these wrongs. Ask the higher power to help with removing the shortcomings that you have. Make a list of everyone, you hurt. Make amends to each of these people as long as it does not hurt them more. Continue to self examine and continue to improve. Through prayer and meditation, continue to improve your contact with the higher power. Seek and have a spiritual awakening by performing these steps and help others to do the same. The core beliefs of all 12 step programs work off from these basic 12 steps. In order to complete the program you have to finish the steps. Al Anon group meetings are meant to be mutually supportive. The meetings and the group follow these principles. When attending a meeting it is important to remember that these principles are supposed to govern everyone in them. Although Al-Anon is not a religious organization it is a spiritual one. The belief in the higher power is pervasive throughout the meetings and activities. Part of the idea behind Al-Anon focuses on letting a higher power in. Call 800-895-1695 toll free anytime for help finding the treatment you need. According to the American Bar Association, Al-Anon meetings almost always start on time. They also almost always finish on time. The meeting leader or chairperson will recite the serenity prayer and the 12 steps. Then he or she will welcome new comers and those from out of town. Sometimes they will go over group business at this point other times they will start the main part of the meeting. There are a few different types of meetings. Each of these meetings is runs a bit differently. Open meetings – these meetings are available for anyone who wants to attend. This includes therapists, psychologists, students, and writers. Although they follow a similar format, it is important to know that others might be there. Closed meetings – these meetings are members only. They guarantee a certain amount of anonymity. Other members are far more likely to keep things between the group than outsiders are. Step meetings – in these meetings the topic centers around one of the 12 steps. The discussion is about the step, how to cope, and how to accomplish it. Speaker meetings – these meetings are not generally discussion meetings. A speaker tells the group their story. In normal meetings, everyone gets a chance to share, in speaker meetings only the speaker shares their story, although there might be questions later on. Beginner meetings – these meetings are to introduce the 12 steps, traditions, and concepts to new members. Beginner meetings are focused on explaining how things work and the program itself. Anyone interested in joining and any member can attend any of these meetings. After the main portion of the meeting, the leader closes the meeting with a prayer and closing announcements. Meetings normally end on time although some people choose to stay after to talk or socialize. Meetings are usually very structured and the central ideas of Al-Anon are about sharing so people do generally share at meetings. You are not required to do this. No one is going to force you to share anything beyond your name and the fact that you are choosing not to share. One of the rules of Al-Anon is that what you see and hear at the meetings remains anonymous. Talking to people who are not members about things that people said during a meeting is strictly forbidden and extremely bad form. Being respectful in any situation is a good idea. Talking while the speaker is, is generally a bad idea. Common courtesy is a good idea during these meetings. It is important to remember that everyone is in the same situation you are. The things they are talking about are hard for them, the least you can do is be respectful of their time. Finding an Al-Anon meeting is not difficult. Meetings usually take place in churches, community centers and other places like this. Most of these places have flyers or other announcements for the meetings. You can also look online, ask your doctor, or therapist.